Is Passing Efficiency Holding Back The Wyoming Offense? The Wyoming Cowboys are coming off a 17-13 loss to Hawai’i last week. In that game, the Pokes had just 244 yards of total offense against a Hawai’i football team that had allowed at least 411 total yards of offense against FBS opponents so far in 2018. The Rainbow Warriors entered the game as the 111th ranked pass defense in college football allowing 279 yards per game but the Cowboys could only muster 87 passing yards against their secondary. Those 87 yards were just two yards more than Navy (a triple option team) had against Hawai’i in September. Now you may view the above stats and the lack of a passing game as just an isolated incident as Wyoming is in a rebuilding year on offense. Wyoming is starting or heavily using freshman at quarterback, the offensive line and at the running back position. Yet, when you look at the complete offensive picture putting together some offensive numbers since Craig Bohl took over in 2014 the picture isn’t pretty. Wyoming has had just one productive offense in five years with the other four years (including this year so far) ranking among the worse in all of college football. Below you can see Wyoming’s points per game numbers along with their national ranking. As we all know, the Cowboys had a rough start offensively under Bohl as the program transitioned from the spread offense to the power run game system used today. The first two seasons produced just 21.1 and 19 points per game with national rankings in the 110’s. In 2016 Wyoming took a huge step forward averaging 35.9 points per game with an offense that ranked in the top 25 nationally. Since that breakout season with Josh Allen, Brian Hill, Tanner Gentry and Jacob Hollister the offense has regressed quite a bit and the numbers so far this season are worse than they were in 2014 and 2015. Besides points, another key offensive metric is yards per pass attempt. This statistic measures how efficiently an offense is in the passing game. In 2009 the Fifth Down Blog in the New York Times outlined the statistic summarizing a piece from Kerry Byrne who wrote: “To put it most simply, passing yards per attempt is the single most important indicator of success in all of football. The short version is this: Teams that win the passing YPA battle almost always win the game. Teams that lose the passing YPA battle almost always lose the game.” With that in mind, here are Wyoming’s yards per pass attempt numbers the last few seasons. As you can see above Wyoming had two so-so years in terms of YPPA then spiked in 2016 but have taken major steps back in 2017 and 2018. 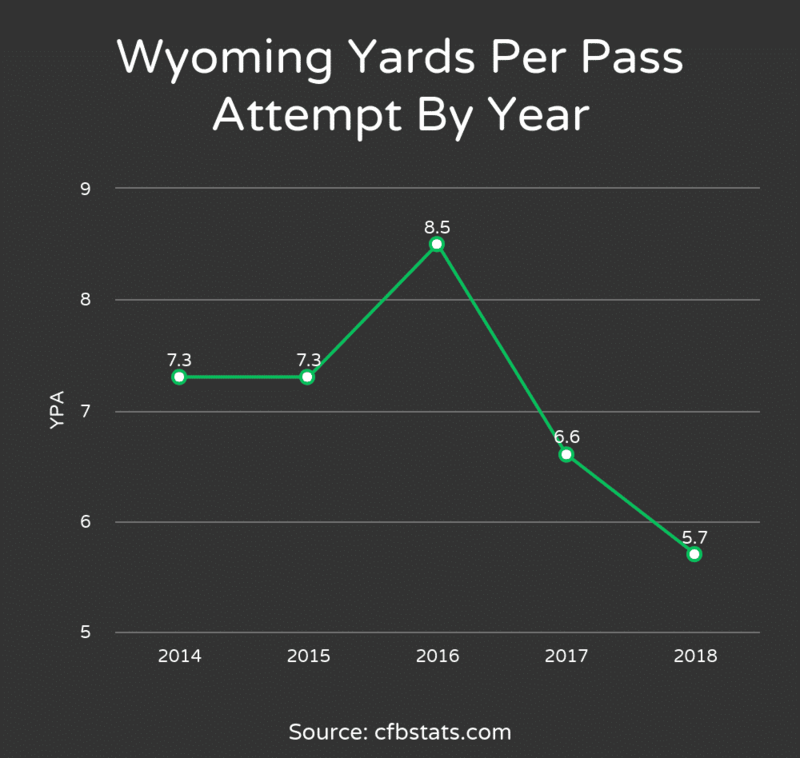 This should be a major cause for concern because if the yards per pass attempt is as important as some football statisticians say Wyoming is in some big trouble. To test this number, I decided to calculate the game by game win and loss record for Wyoming under Craig Bohl when winning and losing yards per pass attempt battle and the results were staggering. We all understand that Wyoming under Bohl wants to hang their hat on the running game but you still have to have a threat of the passing game in order to run the ball efficiently. It’s amazing the numbers RB Nico Evans and the Wyoming run game have put up this season so far (144 yards per game) considering the Cowboys are often facing 8, 9 and even 10 man defensive boxes at times as they don’t view the Wyoming pass game as a threat (and for good reason). 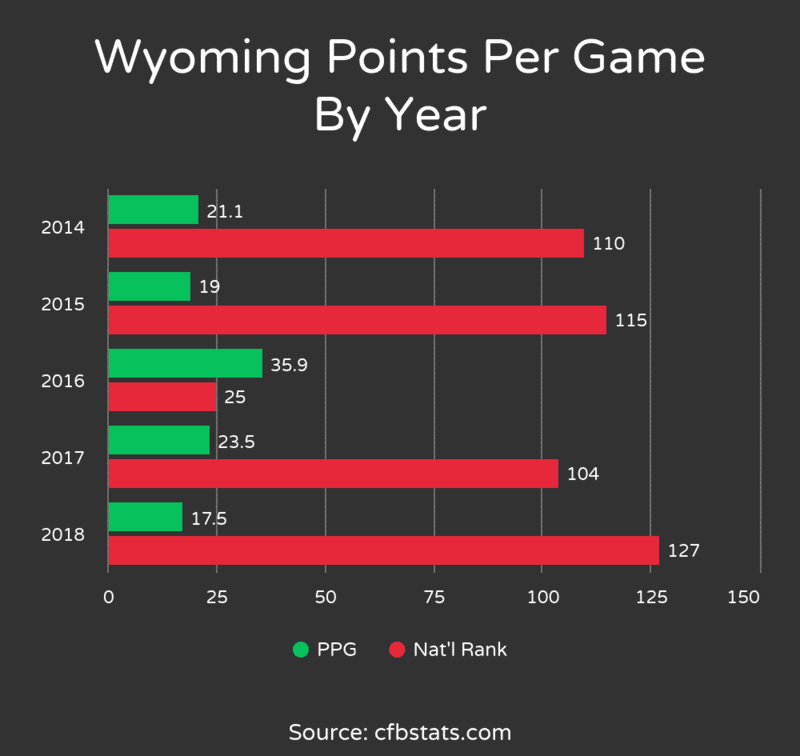 In modern college football, you have to be able to throw the ball when needed and the Wyoming passing game has failed to do so consistently the majority of the past five seasons. The good news under Craig Bohl is he has faced an underwhelming side of the ball before. Under Steve Stanard the Wyoming defense ranked 102nd, 102nd, and 101st in scoring defense giving up 30 points or more per game in his three years as the defensive coordinator. Bohl made the tough decision to go in a different direction for the good of the program. Outside of one season that saw Wyoming host and almost win the Mountain West conference title. The offensive side of the ball has been statistically worse than Stanard’s defenses ranking 110th, 115th, 104th and 127th so far this season in scoring offense under the direction of offensive coordinator Brent Vigen. Tyler Vander Waal has looked very comfortable in the two-minute drill. Mix in some up-tempo series to spark the offense and keep the defense on their heels. I doubt this will ever happen though because the coaching staff seems too dogmatic in their style of play even though they aren’t having much success offensively. Too often we see Austin Conway or Rocket Ismail Jr not catch a pass or have a target until late in the first half or in the second half. Find a way to get your play-makers the ball early with easy throws like screens and quick outs. Even when Josh Allen was the QB I had this complaint. Throw some quick slants to your wide receivers, utilize your tight ends in the intermediate passing game. Wyoming often gets too vertical in the passing game for their own good and when the 30 and 40 yard passes aren’t being completed the offense sputters. Wyoming and the offensive staff still have time to turn this offense around and find a way to be more effective in the passing game but we are going to have to see some major adjustments made. I have to believe that soon the pressure will be on and Bohl will have no choice but to rethink how the offense is being operated and who is pulling the strings as he did with the defense just two seasons ago. His job and the future of the Wyoming football program may depend on it. Like the coaches are going too listen to a newspaper writer? Good luck! You are spot on and absolutely correct! Chad, I completely agree with everything you’ve stated above and myself and my coworkers and friends have had the exact same conversations and have come up with the exact same suggestions on how to improve the O. It is beyond me why we don’t get Conway the ball earlier than in the 3rd or 4th quarter. Yes, “Establish the Run” is a great mantra to have, but you can’t do that if you go 3 & out on nearly every possession and then all of a sudden sustain a drive for 40 or 50 yards only to have it end in a FG or become negated by an untimely penalty that puts us out of FG range and we are forced to (gasp) punt. Bohl has routinely stated in every single news conference that flipping the field, time of possession and 3rd down conversions are the most important aspects of our game but percentages of converting a 3rd and long are very low, even for college. Personally, I think Vigen needs to go and we need fresh blood or a fresh mindset in there. When we had Hill and Allen, it was such a great mix of run and pass because both were equally dangerous. When we had only Allen last year, and before our receivers miraculously learned to catch in the Bowl Game, we fared ok because of our stellar D. We sputtered (were in position to win because of our D) when we lost Allen for a couple games and would have easily won those had he been healthy for those contests. This year, it seems we have a decent run game with Nico being 1st in the MW even while missing two games. Yet, teams know exactly what to game plan for because we don’t pass. I’ve been screaming at the top of my lungs from the front row in Section 28, “Over The Middle!”, “Utilize the Tight Ends!”, “Quick Slants!”, from game one of this year. It also seems like Vander Waal is scared back there in the pocket or gets flustered too easily. Could def be 1st year jitters. Anyway, that’s my 2 cents. Thanks for the content on your page. I always enjoy all the little tidbits of info you provide and your insight. Ryan, thanks so much for reading and your kind words!